Analysis and reporting are the most time-consuming aspects of site or app performance tracking in Google Analytics. If you ever wished or thought if only it was quicker, then this post is for you. There are a number of techniques you can implement to speed up your data analysis and number crunching. Here I’ll cover 6 of them. Google Analytics dashboards are a great way to monitor metrics that are important for your business. But instead of logging in every day or week, or however often you tend to check them, schedule automated email reports instead. 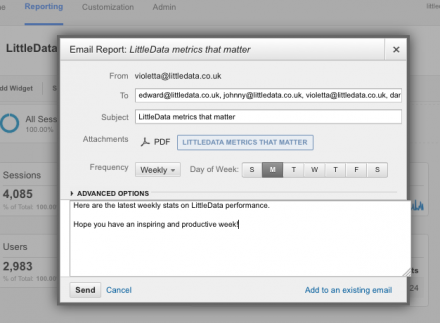 At Littledata, we have a select few metrics that we keep track of on a weekly and monthly basis. The whole team gets an email report on a specified day, allowing everyone to get the latest stats without someone on the team having to get those numbers manually every time. To set this up, go to the dashboard that you want emailed to others (or yourself), click ‘Email’ and fill in the details. If you’re scheduling the email to go to your team on a regular basis, why not add a nice message in the email body. To edit the scheduled emails you’ve set up previously, go to Admin > View > Scheduled Emails (towards the bottom of the list). 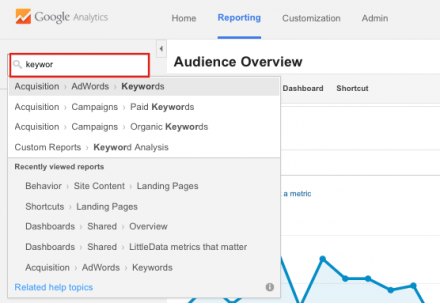 Shortcuts in Google Analytics allow you to quickly view the reports you use most often. Even better, they remember the settings you applied to any report. So if you apply an advanced segment or another customisation to the report, saving it as a shortcut will remember your preferences. Except for the date range – that won’t be remembered. You can find the shortcut option just below the report title, and once added, you’ll find your shortcut reports at the top of the reports list in the left panel. If you find yourself wondering where a particular report is, use the search found at the very top. Instead of having to go through an extensive report list trying to find something you vaguely remember seeing last month, you get suggestions of what you might be looking for as you type. So you only need to remember or guess part of the report title that you’re looking for. Did you know Google Analytics has keyboard shortcuts? They allow you to move around the report much quicker and the date range keyboards make a big difference to a workflow. Picking date ranges can be tedious and annoying so I’ve found these to be the best. If you’re already using keyboard shortcuts on your devices, you won’t need convincing of their usefulness. To view this complete list of shortcuts in Google Analytics at any time, use a shortcut: ? Goals are valuable in understanding how well your site or app helps you achieve your objectives. Unfortunately, we see a lot of businesses who either find it too complicated to set up or have done it incorrectly. Speaking from personal experience, it only takes a little practice to get the hang of it, and once setup, you get essential conversion data in your reports. You’ll be able to evaluate your marketing efforts and campaigns much more effectively. Check out Google’s guidance on goals and my guide on how to set up a destination goal funnel. 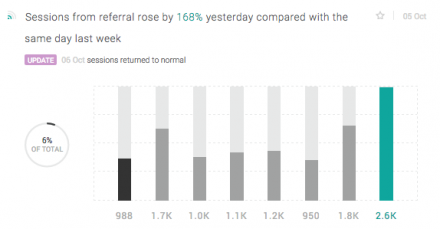 We have a clever tool that looks through all of your Google Analytics data and finds the most interesting changes to report on. There are over hundred of GA reports so getting automated summaries that you can act upon will save you hours of work. Littledata tool doesn’t require installation and it’s quick to set up – all you need is an existing Google Analytics account to sign up with for free. The reports you’ll get are also great for presenting to colleagues in meetings, as other users have said. We’re also working on bringing you benchmarking information, customised tips on how to improve your Analytics setup and what you should be tracking. Whilst, not the quickest to get used to, Google’s query explorer tool can be powerful for those working with large and complex datasets. Some of our biggest clients’ websites get millions of hits a month, which can cause discrepancies in data analysis (especially when data is sampled). So I use the query explorer tool to verify the data that clients ask for. To use this tool, you will need to know your metrics from dimensions and learn more about how to use segments, filters and query building. If you’ve got questions on any of the above, don’t hesitate to comment below or get in touch!